In these pages, we have claimed that what geologists call “volcanoes” on Mars are in fact stupendous blisters created by electrical arcing on a cosmic scale. Such raised bell-shaped blisters can be found on the caps of lightning arrestors after a cloud-to-ground strike. They are called "fulgamites.” The material that forms the elevated fulgamite is scavenged from the surrounding surface to produce an encircling depression or moat. Olympus Mons has such a moat, which does not match the bulge expected from upwelling magma beneath a volcano. Earthly lightning usually consists of a number of strokes in quick succession along the same ionized path. The discharge that creates a fulgamite is often followed by successive lesser strokes that may excavate overlapping pits on the top of the fulgamite. The six overlapping circular and flat-floored pits on the summit of Olympus Mons display precisely such a pattern. The smaller craters center on the walls of the larger ones and are cut to different depths, as if with a cookie cutter. Clearly, the “caldera” floors are not volcanic, and no analogy for such overlapping flat floored craters can be found on any volcano on Earth. 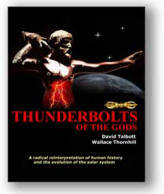 There is no evidence of creation by upwelling magma. In an earlier TPOD, we summarized the behavior of electric arcs to positively charged surfaces in the laboratory, noting how the arcs produce superimposed circular depressions on the summit of the blister. 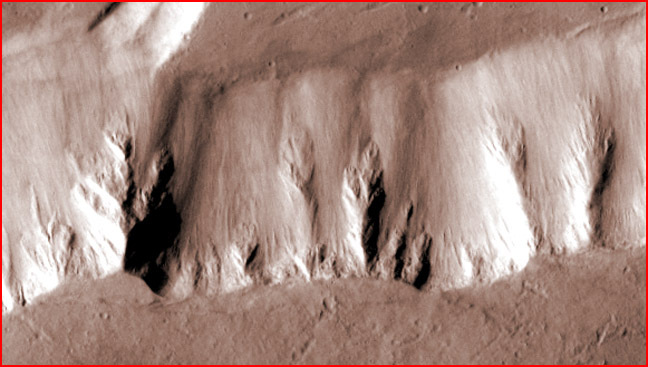 To confirm that the markers from such an event are indeed present on Olympus Mons, we have noted: the finely filamented “mane” of channels radiating from the summit; the presence of anomalous scoops and gouges on the flank of the great mound; the steep escarpment; the complex networks of shallow grooves on the flat floors of the “caldera” craters; the depressed terrain surrounding the escarpment; and the concentric ridges and valleys in the mysterious “aureole.” All are diagnostic of a single phenomenon: an electric discharge impinging on an anode, or positively charged surface. More recently, we noted an additional feature that, to the best of our knowledge, can only be explained as an effect of electric discharge. Around the escarpment of Olympus Mons, we find repeated sharply defined dendritic ridges. Whereas dendritic channels are indeed typical of fluid erosion patterns, precisely the reverse is true in the case of similarly branching ridges. No known geologic process is observed to create a coherent ridge pattern of this sort. But as we have previously noted, the electrical “Lichtenberg” figure matches the pattern precisely. The case for the electrical interpretation of Olympus Mons becomes all the more persuasive in the face of recent close-ups of the caldera’s flat-floors and enclosing cliffs. In a high-resolution image taken by the Mars Odyssey Mission’s THEMIS camera, new details are evident, including cleanly excavated channels and a remarkable network of elevated “veins” undulating across the surface in entwining and knotted rope-like configurations (a detail that is indeed worthy of a future TPOD)—and one other feature. Along the steep caldera wall seen at the bottom of the picture are dendritic ridges that boldly defy the theory of volcanic origins (to fully appreciate the relationship of these vertical ridges to the caldera, we urge the reader to view the spectacular THEMIS image directly). It is only appropriate, therefore, that planetary scientists be asked to account for these extraordinary details in terms of their volcanic theory of Olympus Mons. One reason for the urgency of this is that planetary scientists have, for several decades now, presented their interpretations as fact.